I am a little obsessed with ombre cakes at the moment. Pintrest is a veritable treasure trove of inspiration. As are other blogs. This rose cake is really not as hard as it looks-all you need is a few Wilton 1 M tips and some good gel food colourings. I love that it’s simple to do but stunning to look at – and all edible unlike cakes covered in fondant and sugarpaste. Although I think cakes look pretty when covered in fondant and sugar modelled stuff and sugar flowers I prefer cakes to all be edible and I find myself and others just peel sugar decorations off and leave to one side. So I trawled the internet (as you do) and found some good inspiration on Pintrest and here and here. When piping the roses you can practise on a chopping board or on the actual cake-it’s very easy to scrape a rose off with a spoon if you go wrong. When doing the three different colours you can spread some on a chopping board next to each other to see how they will look. That is probably the most finicky bit of the whole process-separating the icing and colouring it-the actual piping is very quick! 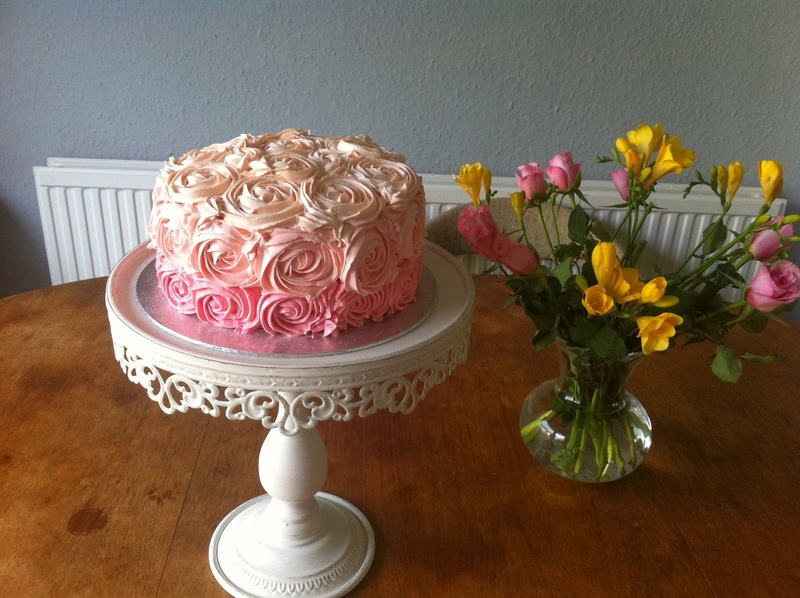 It was a really hot summers day when I made this so you can see my roses are very soft-the second time I made this cake (coming soon- a purple ombre one!) it was much cooler so it was easier to pipe the buttercream and I didn’t have to keep putting it in the fridge to firm up! I used a creamy white chocolate buttercream for the roses on the outside and for the inside it was a standard Victoria sponge and strawberry meringue buttercream. The latter is a buttercream that is slightly harder to make but silky smooth and very yummy! I wanted pink layers when you sliced into it and the fresh strawberries lift the cake a bit. 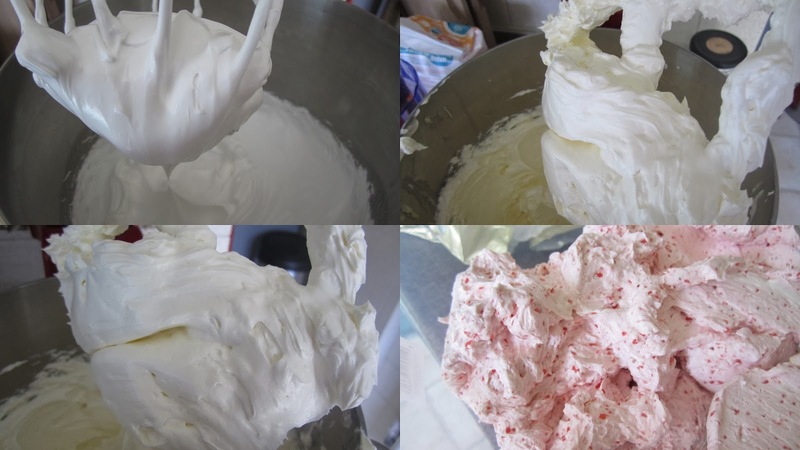 You could alternatively use whipped cream with strawberry puree mixed through or use the same buttercream as on the outside. I used Wilton rose pink gel food colouring to colour the icing. I always start with mixing the darkest color first and then do the two lighter colors You want the dark pink to be quite dark-otherwise there won’t be a decent enough colour gradation! 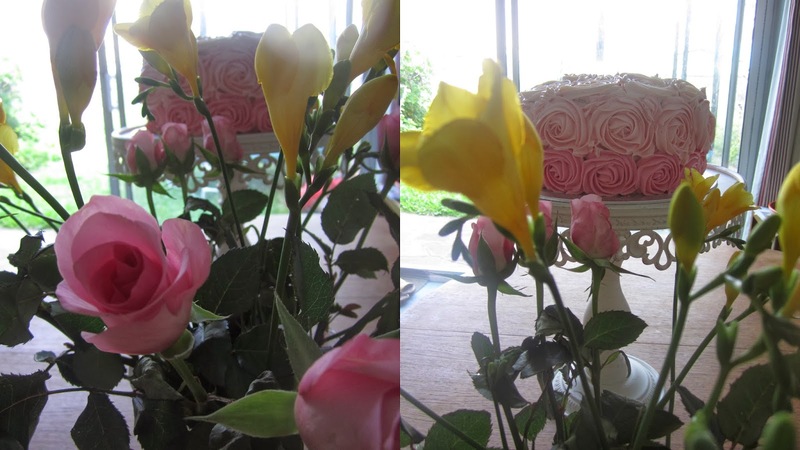 I crumb coated the cake and put it in the fridge for about half an hour to firm up before doing the roses. I have written about the Victoria sponge here (I made 1.5 times the recipe as I wanted three layers) and you can find the strawberry meringue recipe here-it is from this Martha Stewart book. The creamy buttercream recipe is below-I make double and always have some left over which I freeze. Better to have more than you need in case you over color one part or something! 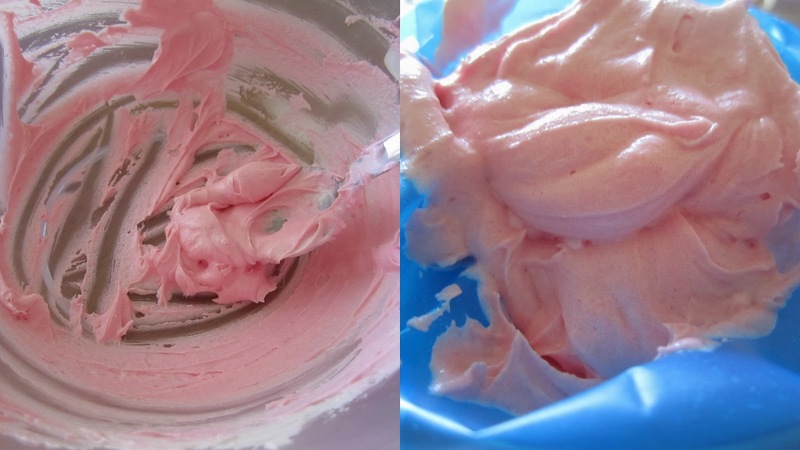 The strawberry meringue buttercream as it progressed-no butter, with butter added and then with strawberry puree added. Put the chopped white chocolate into a small bowl.melt over a ban-marie or in microwave. set aside and allow to completely cool. Sift salt and powdered sugar over the butter, in a large bowl. Cream the butter and sugar mixture together until light and fluffy, scraping the sides of the bowl as needed. Measure the whipping cream into a cup, and stir in the vanilla extract. With the mixer running on low speed, gradually pour the cream mixture the bowl. Once the cream mixture has been incorporated into the frosting, fold on the melted white chocolate until incorporated. Increase the mixer speed to medium-high, and beat frosting for an additional 3 minutes. Makes about 2 ½ cups of frosting (I made double for the cake). looks lovely~ I'm not much of a baker, but I feel like trying it coz it looks absolutely lovely!